From a small child who dreams of flight to the veteran who has hours in the sky, EAA AirVenture Oshkosh is a euphoric experience that is sure to spark the imagination for any aviation enthusiast. EAA AirVenture takes place every year in Oshkosh, Wisconsin and brings in more than half a million visitors and over 10,000 aircraft. 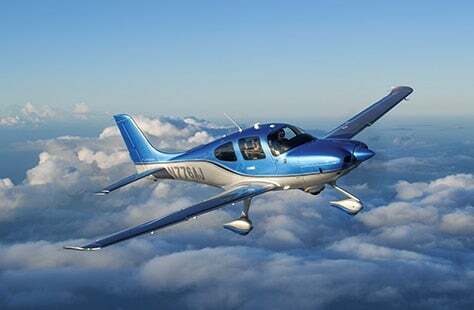 And, of course, the best way to experience this week-long event is to fly in your Cirrus aircraft. With pilots flying in from around the world, the final approach may sound challenging. But with a little preparation and some first-hand knowledge your experience will be smooth and enjoyable. Here to offer some expert advice is Thomas Klotz, Senior Vision Jet Flight Instructor at Cirrus Aircraft. With ten years of flying under his belt, Thomas has experienced this journey countless times over the years – both as a private pilot and Cirrus Aircraft corporate pilot. He offers some of his own wisdom to assist those who would like to join in the largest aviation gathering in the world. What is it like to experience EAA at Oshkosh? Oshkosh is a mecca for all pilots. In fact, I call it my favorite holiday of the year. Where else in the world are you surrounded by thousands of fellow aviators? The atmosphere is fueled by curiosity and excitement – and it’s easy to make connections that you will have for life. What kind of things should people expect to see at EAA? Whether you’re interested in historical aircraft or the latest technology, this is your all-access pass to aviation. The show is huge and grows every year, so there is always something new to be seen, including the highly anticipated night airshow on Wednesday and Saturday. The show is truly meant for everyone – from the veteran pilot to a young child fascinated by planes. The entire show is designed as a real experience, including exclusive access to unique aircraft from around the world. What is your favorite part of EAA? It’s about more than just airplanes – it’s about the multi-generational relationships that are formed through aviation. That’s the best part, by far. And nowhere else in the world do you have access to so many fellow enthusiasts in one place. What is a Notice to Airmen (NOTAM)? If you want to fly to Oshkosh, the NOTAM is the essential playbook for what you will need to know, and you should have a copy onboard. Each year there are small important changes, so make sure to review it prior to departure. Do I need to fill out any forms prior to arriving at Oshkosh? No. However, you will need to print a parking sign and departure sign. Immediately after landing, place the parking sign on the pilot’s window so the ground crew can direct you to park and tie down your aircraft. Your departure sign will determine whether you are taking off via VFR or IFR. If you plan to operate IFR, be sure to read the NOTAM carefully (p. 24), as there are specific requests and clearances needed. Having flown to Oshkosh multiple times, is there anything you would recommend? Bring extra fuel if possible. There’s a lot going on in a small place so weather, parking, traffic or other variables may require you to stay in a holding pattern or re-route to a neighboring airport. Being such a large event, are there any unique alterations on the radio frequency? Yes. Because of the large number of aircraft trying to land, the communication is mainly one directional. Pilot chatter practically ceases upon arrival. Instead, your communication is primarily with ground controlmen, who spot each aircraft and call to the pilot to rock the aircraft’s wings in acknowledgement – a simple left and right action of your wings. The radio frequency for Oshkosh 2018 is 132.3. Should you expect a holding pattern? What might be a challenge for the final approach? A spot landing is not unusual at Oshkosh, so I would recommend practicing spot landings before your trip. The runway at Oshkosh will have a painted color scheme as well as various numbers, and ground control may direct you to land on a specific color or number. While it may require some practice, it’s a good challenge! How can you get more information about departures while at Oshkosh? Departure briefings occur daily, from 0700-1330 and 1630-1800, and provide an informal recap on safety, weather and other important items. These are held in the main Departure Briefing building, located east of the control tower (as well as other dedicated small briefing buildings). EAA staff in aircraft parking areas can also provide information and extra resources can be found on the website. EAA AirVenture Oshkosh is a must see for all ages and we look forward to meeting you this year at the Cirrus Aircraft booth on Celebration Way. Find our full schedule of events here.